Rio Ferdinand says he would "pack his bags and go straight there" if he was recalled to the England squad. 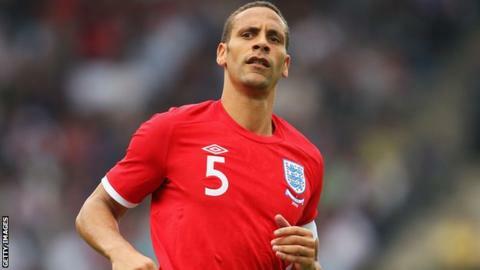 Ferdinand, 34, has not played for his country since June 2011 and was left out of Roy Hodgson's Euro 2012 squad. "I'm no different to anyone else - I love playing for England," he said. "If I'm not then I'll keep doing what I'm doing for Manchester United." In October, Hodgson denied telling London Underground passengers the defender's England career was over. But Hodgson did apologise after admitting he had discussed the defender's international future with members of the public as he travelled on the Tube. Ferdinand, who has won 81 caps for England, has not played an international match since the Euro 2012 qualifier against Switzerland at Wembley. He was the highest-profile omission from England's Euro 2012 squad, with Hodgson insisting the move was a "footballing decision". His absence avoided a potential conflict with Chelsea defender John Terry, who was named in Hodgson's squad as he awaited trial over allegations he racially abused Ferdinand's brother Anton. Terry was cleared of the charge at Westminster Magistrates' Court in July, but was later found guilty by the Football Association. Rio Ferdinand has not been picked by Hodgson following Euro 2012, with United manager Sir Alex Ferguson admitting the centre-back's international exile benefits the Premier League club. "It is what it is," Ferdinand. "I'm not being picked. The manager hasn't picked me. If I got picked I'd pack my bags and go straight there." In an interview broadcast on BBC Radio 5 live on Monday, Ferdinand also warned younger players not to become "sidetracked" by football's huge salaries. He said the moment he realised his life and career should not revolve around money came after being told his new car was worth more than the flat owned by his father. "That was the moment you go 'you know what - I need to revaluate the way I'm thinking'," said the London-born player. "It is good to get nice stuff but it's about playing and what you achieve as a player. "Do you want to play for England, do you want to win trophies? Some kids aren't lucky enough to have these moments or don't realise those moments when they hit them. I was fortunate I did."